The number of cases and deaths from breast and cervical cancer are rising in most countries, especially in the developing world where more women are dying at younger ages, according to the study Breast and cervical cancer in 187 countries between 1980 and 2010: a systematic analysis. Researchers from IHME and the University of Queensland collected data on mortality and incidence for breast and cervical cancer, showing that while more women developed breast or cervical cancer in 2010 than in 1980, the probability that women will die from either disease has decreased. 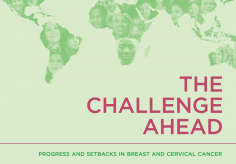 Coinciding with the study release, IHME published a report, The Challenge Ahead: Progress and Setbacks in Breast and Cervical Cancer, which provides global, regional, and country data for cases, deaths, and risks over the past three decades. The work was funded by Susan G. Komen for the Cure. Breast and cervical cancer are important reproductive health problems for women, and programs to address the burden of these diseases have gained attention in the discussions leading up to the United Nations High-level Meeting on Non-communicable Diseases. Evidence shows that screening and treatment for breast cancer are effective, as is human papillomavirus vaccination for cervical cancer. Because of the importance of these diseases and the potential for effective treatment and prevention, it is critical to monitor trends in the mortality and incidence of breast and cervical cancer, by country and over time. Overall, the number of cases and deaths from breast and cervical cancer are rising in most countries, especially in the developing world where more women are dying at younger ages. Global breast cancer incidence increased from 641,000 cases in 1980 to 1,643,000 cases in 2010, an annual rate of increase of 3.1%. More than two-thirds of cases of breast cancer in 2010 were in women aged 50 years and older, most of which were in developed countries. For women between the ages of 15 and 49, there were twice as many breast cancer cases in developing countries than in developed countries. In 2010, 425,000 women died from breast cancer, of whom 68,000 were between the ages of 15 and 49 in developing countries. Global cervical cancer incidence increased from 378,000 cases in 1980 to 454,000 cases in 2010, an annual rate of increase of 0.6%. 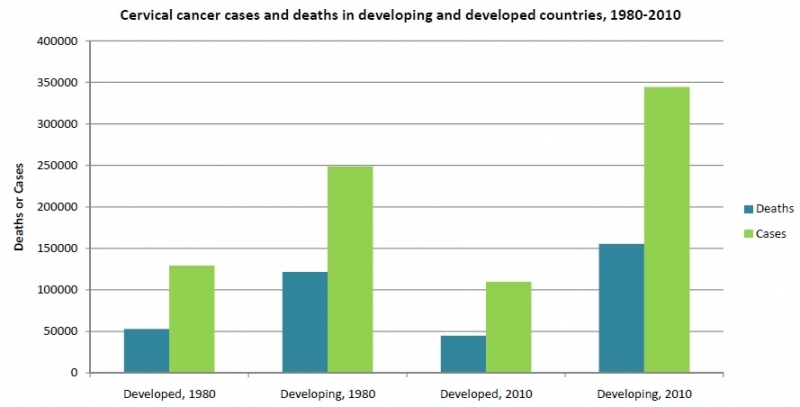 New cases of cervical cancer occur more often in developing countries than in developed countries in all age groups. 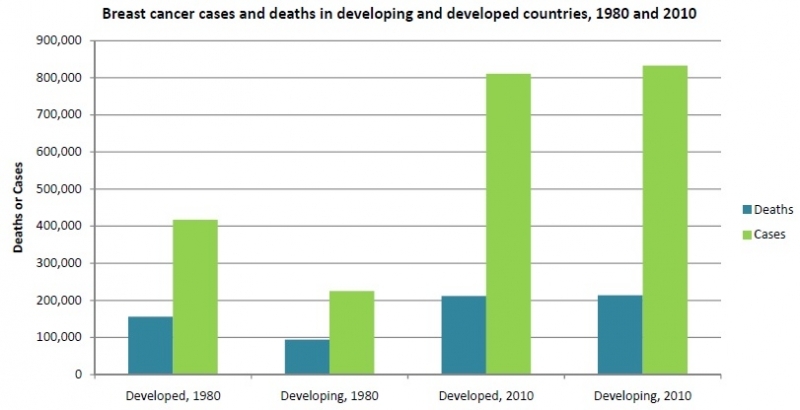 In 2010, 200,000 women died from the disease, of whom 46,000 were between the ages of 15 and 49 in developing countries. Researchers collected data on mortality and incidence from cancer registries, vital registration systems, and verbal autopsies between 1980 and 2010. They modeled the mortality-to-incidence (MI) ratio, a measure of the women with cancer who die annually, and supplemented vital registration and verbal autopsy data with incidence multiplied by the MI ratio to yield a comprehensive database of mortality rates. IHME researchers based their estimates on additional sources of data, especially for cancer deaths, including the use of verbal autopsy data in countries that lack vital registration systems. Many cancer deaths are inaccurately coded or ill-defined by agencies collecting the data, and IHME methods fix the coding and assign the deaths to the appropriate categories. To generate the MI ratio, IHME improved on previous methods by factoring in age, country, and year. While IHME uses one approach in every country, GLOBOCAN data are based on 26 different approaches for different groups of countries. Many of the approaches used for estimating mortality in the GLOBOCAN data rely on trends observed in Nordic countries, and IHME researchers believe that relying on a limited number of countries leads to an overestimation of MI ratios in many developing countries. The authors suggest that increases in the absolute number of cases and deaths from breast and cervical cancer may be due to the interaction of the following factors: rising population numbers in women of at-risk age, aging of the population, and changes in age-specific incidence and death rates. As a result of the rising numbers of deaths from breast and cervical cancer and the decreasing numbers from maternal mortality, more deaths occur worldwide from breast and cervical cancer than from maternal mortality. Based on current trends, breast and cervical cancer will likely approach maternal causes of death in women of reproductive age in developing countries within the next two decades. The researchers conclude that better surveillance systems are needed to monitor the trends in breast and cervical cancer incidence and mortality. In addition, more policy attention is needed to strengthen established health-system responses to reduce breast and cervical cancer, especially in developing countries.